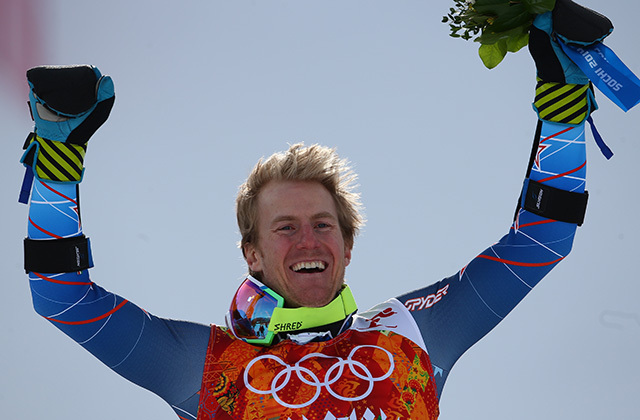 In 2006, at age 21, Ted Ligety became the youngest American male to win an Alpine Skiing Olympic Gold Medal. Since then he’s dominated the men’s alpine circuit, winning five World Cup Overall giant slalom titles, five World Championship titles (the first man in 45 years to win three events at the World Championships: GS, Super-G and Combined, and the first to win three consecutive World Championship titles in GS). His 2014 Olympic Gold Medal was the first ever for the U.S.A. in giant slalom. Overall he has 51 podiums in World Cup competition. Carlo Salmini is an alpine skier, MIT educated engineer with an MBA from the Sloan school. Together, the two men run Shred/Slytech. Back in 2005, Carlo was working in R&D and had developed what he thought were superior carbon-fiber knee and shin guards. So superior that he flew to Mammoth Mountain to try to find national team athletes willing to test his prototypes. 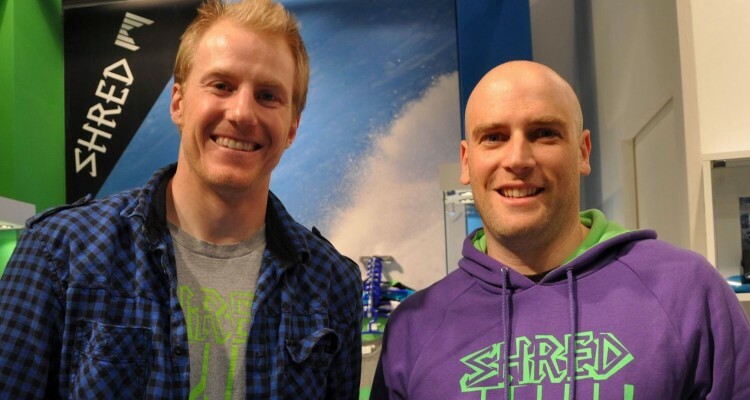 He ran into Ted Ligety, a tech geek, who was psyched to give them a try. That was the beginning. Ted’s testing and R&D insight helped kick off Slytech in 2006. Product testing, Ligety style. 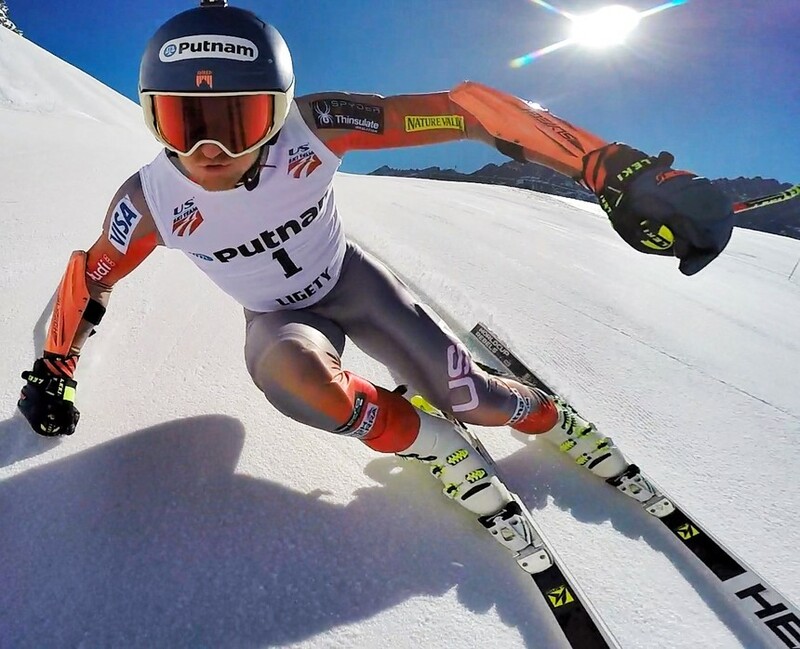 Ted Ligety photo. Ted won Olympic gold in Torino that year. Which didn’t hurt. He leveraged that legitimacy and platform to help Shred Optics and Slytech penetrate. So, that’s the ski story, it’s pretty awesome. But let’s join our heroes as they launch into MTB. They were nice enough to carve out some time in their busy schedules for a TGR interview. Ted's "O" face. 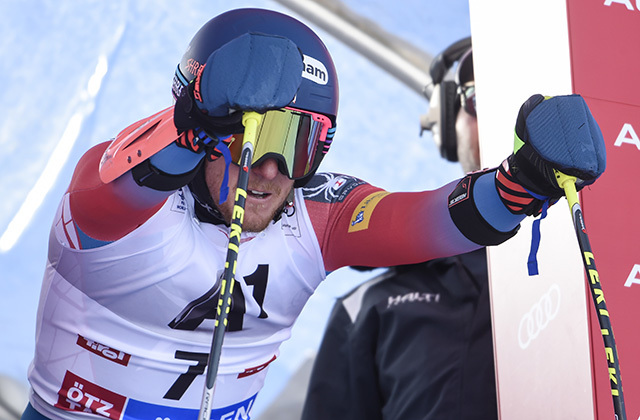 Ted Ligety photo. The two friends mountain bike together and Slytech’s kneepads (TGR review coming soon), helmets and patented body armor are fast joining the larger market leaders at the top of the hill. GW: You make market-leading optics and guard technology for snow. Was translating that expertise to mountain biking, where vision and padding are also critical, a big stretch? Can you run me through the story of the MTB product line, or the decision to move into that market? Is it because you ride MTB and there was an ‘a-ha’ moment. Or was it always the plan to do R&D for snow and then translate that knowledge into other sports? Ted - Our company was born out of a mountain bike ride together. Mountain biking is our summer passion, so as we developed helmet innovations for snow such as Slytech NoShock, it was so obvious to use our know-how to develop a better and safer bike helmet. Plus we wanted to make the products of our dreams, and spending hours riding in a competitor’s inferior product could not stand. 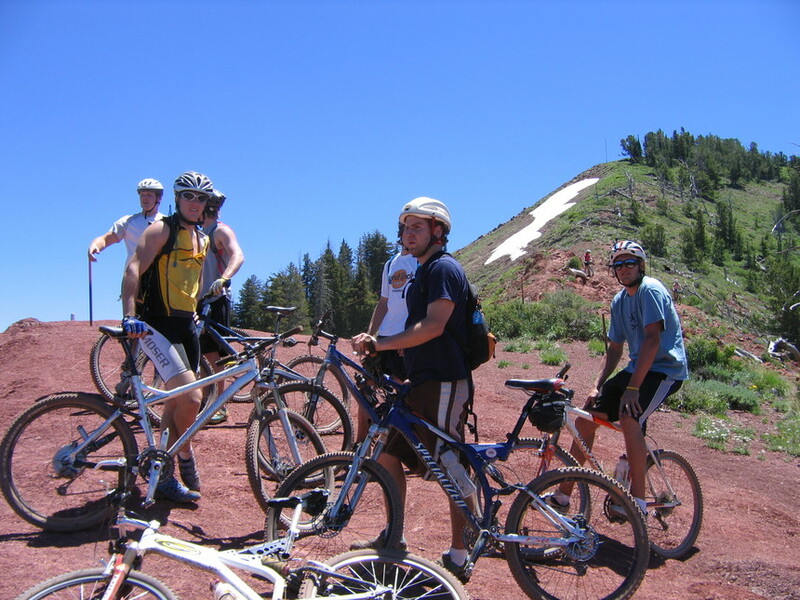 One of the 2006 Wasatch rides that gave ride to Slytech/Shred. 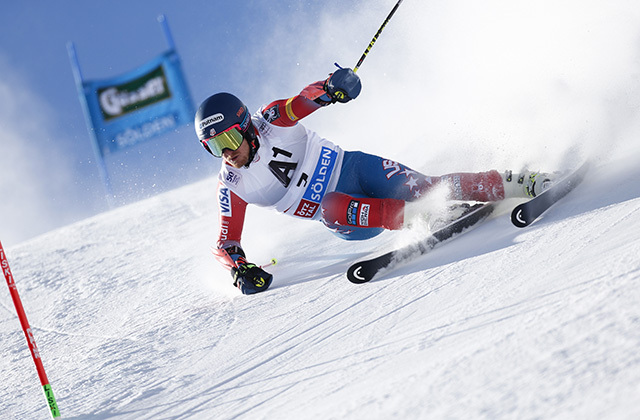 Ted Ligety photo. Carlo - We simply couldn't stand wearing other companies' products while mountain biking, knowing our technology was better and our products would have been better. We had to make our own. We'd been making products to enhance the performance and the fun on the mountains for a lot of skiers and snowboarders, making sure that they would be provided with the highest level of protection no matter if they were dropping huge cliffs in Alaska, going at 100miles and hour on ice or enjoying their time on the groomers. Carlo/Ted -The main reason is that Slytech is our brand for technology, focusing solely on protection performance, while Shred also represents a way of life and the passion of our eyewear and helmets. 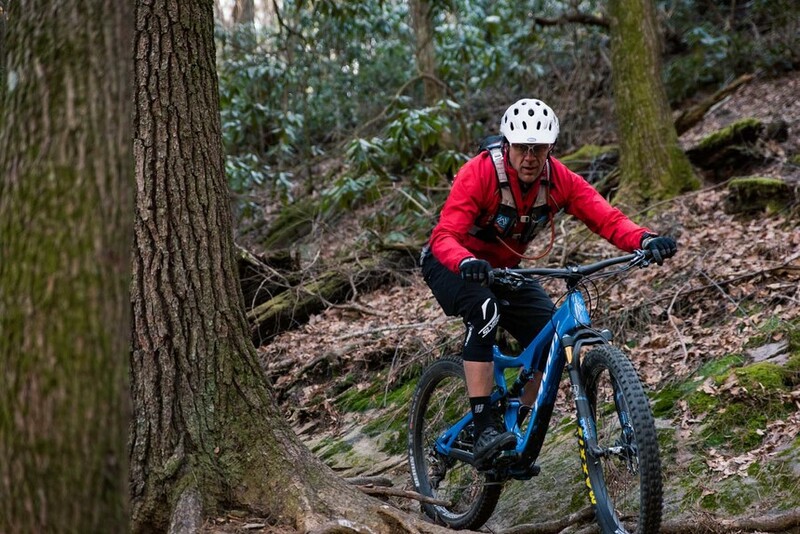 GW: (Ted) Is mountain biking something you do for fun or is it a serious part of the training regimen? If training, can you take me through how you use it? Ted - I mountain bike both for fun and for training. Largely the uphill is my “training” and the downhill is for fun although riding downhill is very similar to skiing in the sense of looking ahead, having to make quick decisions and maintain momentum, so although the downhill is fun, it’s a useful training tool too. GW: How often do you guys ride and what’s your favorite place? Ted - I ride in Park City the second the trails are dry. I generally ride four-plus days a week all summer. I love riding at home in Park City and the trails at Deer Valley. Carlo - I ride mainly in Cortina, Dolomites as I am mainly based in Italy and during the month of August I am able to ride almost every day, otherwise it is a little tricky but I still try to get out as much as possible. GW: Gravity, Flow or XC? Ted: I ride a bit of everything, but I spend the majority of my time riding more XC style, for the fitness side of things, though I love riding the bike park and flow trails. Carlo - Unfortunately not much flow trail opportunities around my area. For that, I have to follow Ted in Park City. At home, I usually climb to earn my descents and my bike is an all-mountain/trail bike. GW: When you ride with each other, do you get a little competitive, talk business, or is it just all fun? Ted - When we ride together its largely for fun, some R&D and sometimes a little business. We love to charge, but I think I put in a lot more miles than Carlo so I’m not taking it competitively. Carlo - I would say that it is a mix of all that. We had the vision for the business on our first ride together, we are two very competitive individuals always trying to push the boundaries, no matter what we do, and we love having fun on a bike. GW: The company’s senior team has an MIT Sloan School grad, who is also an engineer, and one of the most decorated Olympic skiers ever… as you’ve got the ‘vision’ thing dialed, what do you see as Mountain Biking’s biggest challenges for growth over the next 10 years? Ted - People love mountain biking and I see the sport continuing to grow, so the enthusiasm and customers are there. But the retail market is without a doubt in flux, we need to continue to innovate both on product and how to reach those riders. Carlo -We see the sport with its base of consumers growing a lot over the next 10 years, but the current situation of the market and channel saturation are not helping the industry in taking advantage of this. GW: And how do you see Shred/Slytech fitting into that? Ted - We are super passionate about the sports we do and the products we make for those sports. We are always looking for ways to improve our products and to be an industry leader in product innovation. With that we need to continue to build partnerships and adapt to the changing environment. TGR doing a little Slytech kneepad testing. Maxxis photo. Carlo -We need to work on putting together our sales network and find the right team of reps and distributors, but we believe in our product, our passion and know-how as a recipe for success. GW: Well, speaking of innovation, can you take me through the development of your particular brand of ‘smart’ polymer NoShock? It’s got a honeycomb shape and, according to your marketing materials, performs really well on the certification drop tests. Carlo - NoShock is a honeycomb cone configuration that allows us to improve the energy absorption efficiency of our proprietary Slytech material. There's also 2nd Skin XT, a material I developed together with one of our partners while studying at MIT. Carlo flexing the product. Slytech photo. It’s unmatched in terms of delivering comfort and safety without compromise. It has the ability to adapt progressively to different forces and impact speed, protecting thoroughly from low speed all the way to fast impacts. We incorporate this technology both in our patent pending Shred helmets as well as into our Slytech body protection. 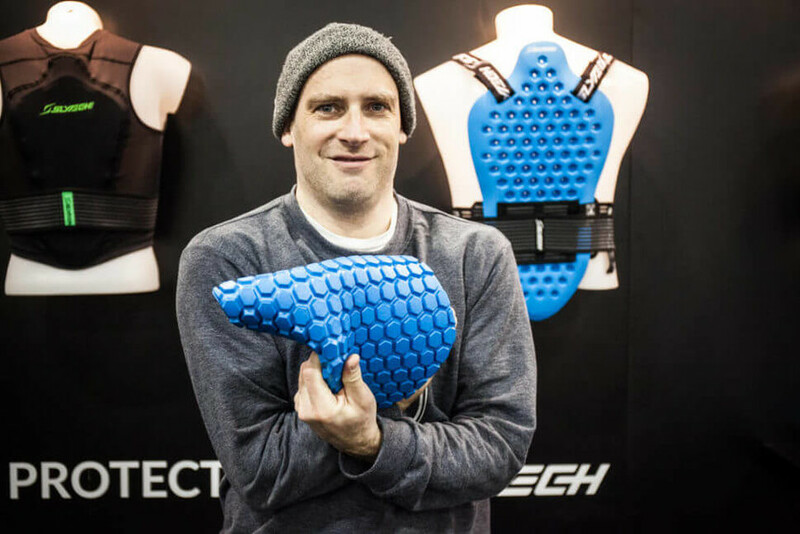 GW: You’ve got a couple new products out now, including a cool spine protector, would you like to take me though how those fill a white space in the market for Slytech? Carlo - Our NoShock technology provides a unique level of safety for our Short Stack and Brain Box helmets and simultaneous comfort and safety for our line of body protection. The Flexi back protector is incredible, as it is as flexible and pliable as a jersey, while still meeting and by far exceeding Level 1 certification standards, and perfectly meets the needs of enduro, trail and gravity riders that are out for a few hours, with its snug fit, water reservoir compatibility and pockets for tools, food, etc. GW: Peter Sagan raced Olympic XC, is it possible we see Ted Ligety in a Big Mountain Enduro, Eastern States Cup or Enduro East stop? Ted - I love riding and the idea of racing is intriguing but I’m not there at this point. GW: The press quotes you as saying you’ve learned from your mistakes, we often don’t think about our mistakes enough, can you take me through a specific example of something you guys tried that didn’t work-and what you learned from that? Carlo -Something that didn't really work out was our attempt to establish ourselves in Southern California as a surf brand. We were spreading ourselves too thin, and we didn't have the same passion, knowledge and experience as we have with the mountains. We looked at ourselves in the mirror and saw the mountains, that's when we decided to go back to our roots and focus on our core, MTB, Ski and Snowboard. Ted - As Carlo said; in an effort to diversify we tried to expand outside of our core, which distracted us from who we are and what we are experts in. We ski/snowboard all winter and mountain bike all summer, we are consumed in those sports and can use that passion to innovate. GW: So, you’ve got optics and guards for Skiing and MTB. What’s next? 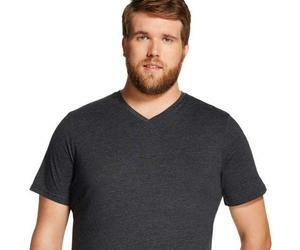 Stay in your lanes, or expand to apparel and footwear? Are there any engineering challenges that still need to be solved for in protection and/or optics? Or is it more about continuing to make it lighter and stronger? Ted - We will continue to focus on who we are and what we know. We have a great product team that are passionate about our sports and are amazing product designers and engineers. We have the imagination and expertise to keep pushing the boundaries and continue to lead the industry in innovation. Carlo -We will stay within our core markets, refining our current top-notch products, coming up with unthought-of innovations that push the boundaries of performance on all fronts, from clarity of vision to impact absorption. So we will make sure to keep on raising the bar to always be able to build the product of our dreams, so that we can share it with everyone loving the mountains as much as we do. I love all interviews with such a great figures!